Posted on Thursday, November 9th, 2017 at 3:02 pm. Who else is already working on planning their Thanksgiving menu? I am, I am! I had the turkey, the sweet potatoes and the vegetables all squared away, but got a little stuck on dessert… I wanted something fun, but traditional. 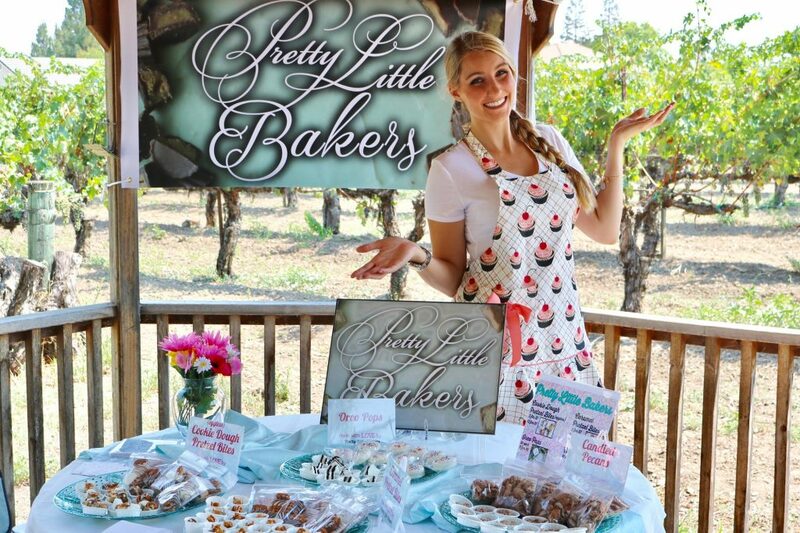 I knew that I could count on my friend Kellie over at Pretty Little Bakers to help me come up with something that would perfectly round out my menu. She suggested a fun and easy crowd-pleaser, so I asked her if I could share it with all of you! Check out her recipe and video below for Mini Bite-Sized Pumpkin Pie and if you need some suggestions for wine pairings, be sure to check out this video from a few years back. Instead of grabbing a sliver of a piece of pumpkin or pecan pie, I thought it would be fun to go for the mini, bite-sized pumpkin pies this Thanksgiving! 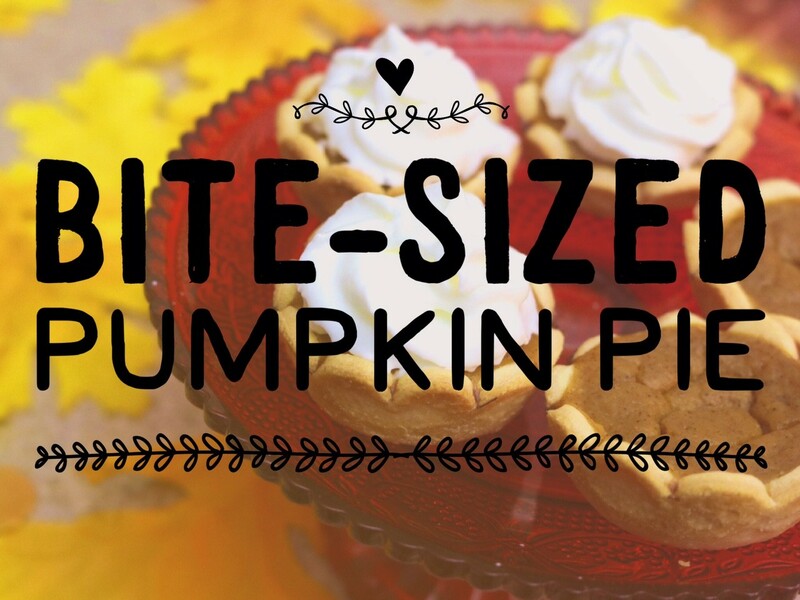 This recipe for mini pumpkin pies only requires 7 ingredients total, one being pie crust and the other being whipped cream. The other five ingredients are for the pumpkin filling. Pretty Little Bakers, let’s grab our aprons and utensils and start baking! Watch the video below to see how to make Mini Pumpkin Pie Bites! Preheat oven to 425 degrees. Spray mini muffin tins with baking/cooking oil. Set aside. In a large bowl, combine pumpkin puree and pumpkin pie spice and mix until combined. Add sweetened condensed milk, salt, and eggs into pumpkin mixture. Whisk together completely. Roll out pie crust dough. Using a 1.5 inch cookie cutter (in the shape of a flower or a circle), cut the pie dough. Re-roll pie dough to cut out more shapes of dough. Gently push the dough into each mini muffin tin. Use enough pressure to push the dough against the walls of each muffin tin. Pour the pumpkin mixture into each mini muffin tin lined with dough, about 3/4 high. The pumpkin mixture will rise while baking, so make sure it doesn’t overflow! Bake for 10 minutes. Lower heat to 350 and bake for another 10 minutes. Remove pan from oven and let cool for 30 minutes. Remove each mini pumpkin pie from the individual muffin tins. Top with whipped cream and serve! Show us how yours turned out by tagging us on Instagram or Facebook!